This post is about one of the best books I read in 2012 – The Power of Habit: Why We Do What We Do in Life and Business by Charles Duhigg. Habits are present everywhere – in our private lives, in businesses as well as in whole societies. They are an integral part of our everyday life and often supersede our rational decision making. This is beneficial because it shortens the time we need to make decisions (such as how to tie a shoe lace or the sequence of actions when we brush our teeth) thus allowing our brain to dedicate its processing power to other activities but it can be also detrimental to us (bad habits such as smoking or eating too many sweet things). Habits develop over time and once ingrained, different part of our brain controls them than the part responsible for our conscious decision making. Once triggered, they just unfold and guide our behaviour automatically. So the question is how to make the best use of this double edged sword. The author argues we can put our beneficial habits to use and change our negative ones and he proposes a following solution. Firstly, we need to understand what habits consist of in general. Secondly we need to understand how our habits function and finally how we can alter them most effectively. 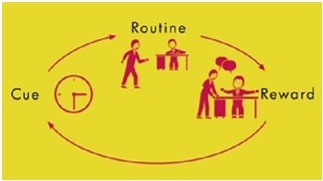 Every habit consists of three parts, together forming a loop. There is a cue, a certain trigger which makes us execute our routine, the routine itself and a reward we get from executing the habit and which incentivizes us do it next time we are exposed to the cue again. The author argues that it is very difficult to change the cue and the reward but relatively easy to change the routine if we keep the former two unchanged and gives a following example. He would eat a chocolate cookie every day which he wants to stop doing as he is putting on weight. His routine is to stand up from his desk, go to a cafeteria to buy the cookie, chat with friends for a while and then get back to his work. So this is his routine; the next step to identify the reward. Here he suggests we should experiment and try doing something else than our usual routine whenever we feel like executing it and then ask ourselves fifteen minutes later if we still feel the urge to do it or not. He tried going for a walk to a park, eating an apple or chatting with colleagues sitting nearby and then seeing if he still feels like eating a cookie. He realised is that what he really wants is not a cookie but a break to socialise with friends. In order to change our habits completely however, we need to be aware of our cues as well. There are five main categories: location, time, emotional state, other people, and immediately preceding action. In order to identify the cue, answer the following questions whenever you do your habit. Where am I? What time is it? What is my emotional state? Who else is around? What action preceded the urge? After couple days, you should see a clear pattern emerging. So the final step is consciously executing your new routine whenever the cue you identified happens and after some time the new habit will override the old one. After making himself go talk to a colleague for ten minutes at 3:30pm every day for couple weeks, the author stopped eating cookies at work all together. Alternatively, you can try getting rid of a habit by inhibiting occurrence of the cue. When the US Army was still in Iraq, they had to intervene in several riots every day and for a long time could not figure out how to prevent them. Then one officer noticed by analyzing video tapes that most riots are preceded by a small small crowd gathering on a plaza, gradually growing in size. At that point food vendors would show up to cater to the crowd, attracting in turn even more people. It is then enough if somebody throws a rock and a riot would begin. Reaction of the officer was to ask the local mayor to keep food vendors out of plazas. The next time a small crowd gathered and started growing in size, signs of a riot were starting to emerge again. The only difference this time was that there were no food vendors and so after couple hours the people got hungry, dispirited and went home. The occurrence of riots decreased substantially. Can you think of any ways you can change your habits or habits of your workplace/community for the better by a simple cost-effective intervention? One friend has just recommended me this article – 10 things extraordinary people say every day. It contains 10 simple lines which can have a far reaching effect on your interactions with people around you. I would not take it however as something you should start saying. Far from that. It is more of an invitation to think about what impact those lines can have and if you can associate yourself with such behaviour. Only if you genuinely feel that way, use them! Have you ever spent hours or even days trying to solve a problem even though the solution was eventually simple and seemingly at hand? It has just happened to me. It’s two in a morning and I am writing a report for my statistical course at LSE. I am doing a regression model to predict birth weight of babies based on several factors. I did a few models but could not decide which one is the best one and have been stuck with it for the last hour and half. It forced me to strip the problem off all the technicalities and get to the point. Then she asked if I cannot pick two models? A very simple question but a very powerful one at the same time. I’ve spent all my time before trying to improve or compare the two models mathematically but have not considered this one. And it is what I am going to do. For certain cases I am going to suggest the first model and for all other cases the second one. The takeaway? If you are stuck, write down your problem in only few words and in a way so that anybody would understand what it is about. Then ask yourself some extremely simple questions about how you can solve it and give them proper thought. Great insights might emerge!